Today at lunchtime I headed over to the strip mall to get some lunch, on the way I passed over a canal and what did I see. 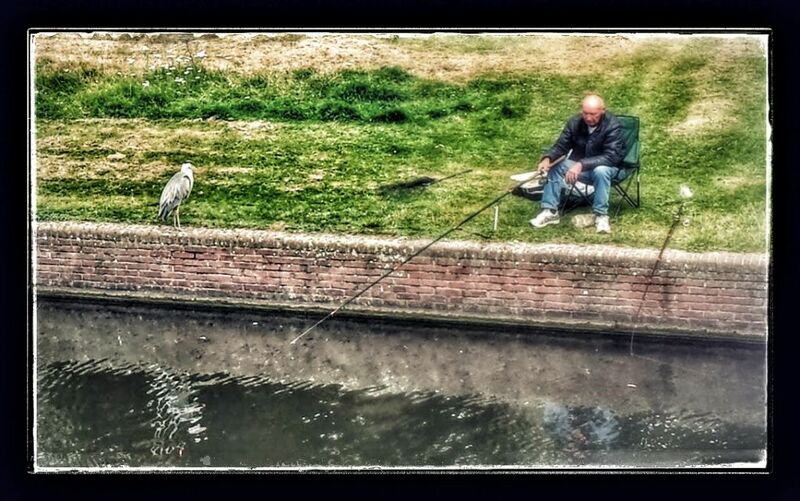 A heron that was given a fish from a fisherman that sat on the bank of the canal near Plesmanlaan and Jacques Veltmanstraat in Amsterdam. The fisherman sat there pulling up fish, the small fishes he gave to the heron. Not the first time I have seen this – the heron has evolved as a species, instead of hunting for food themselves they now get feed by humans. Birds used to migrate in the winter to find a new source of food, this has changed to some degree, some species of birds stay over the winter as they are being fed by humans. The food chain has changed the Heron is waiting for the fisherman to catch a fish.